It takes a certain kind of person to live in isolation on a small island; cut off from the rest of the world, survival takes fortitude, ingenuity, and a deep appreciation for the power of the natural environment. 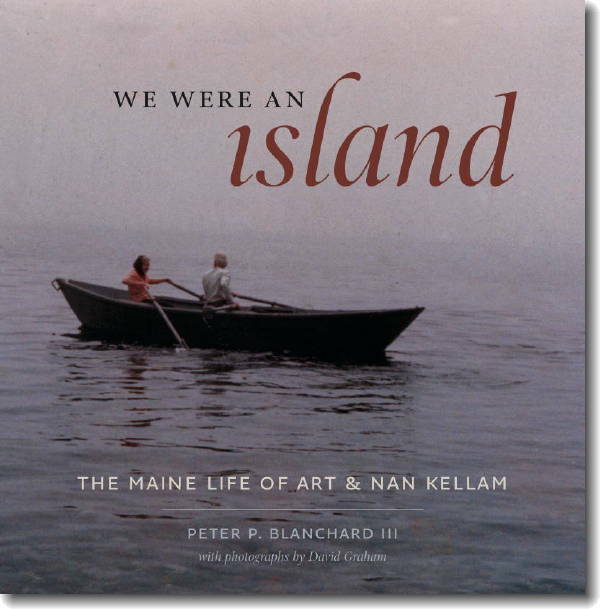 For Art and Nan Kellan, building a home and life on a small island off the coast of Maine was not an easy task, for all its pleasures, but the challenges they faced have made for a compelling new book, We Were an Island. Written by noted environmentalist Peter Blanchard, the book is a melange of journal entries, photographs and narrative, all painting a portrait of a couple deeply in love, learning together how to thrive apart from the conveniences of modern life. Childless and retired from defense contracting at the ages of 38, the Kellans sought to escape from the artificiality and hectic pace of the increasingly urbanized world of the late 1940s. The outer regions of Maine had long been a refuge for artists, writers, and iconoclasts of all stripes; it was here, in the area of Mount Desert and Bar Harbour, that they found their home for the next four decades. Placentia, an 15th century English term meaning “a pleasant place”, was indeed that – a vast 550-acre island off the southern tip of Mount Desert, inhabited by nothing but seabirds, deer, pine trees, and fields of wildflowers. In 1949, the Kellans bought the island, and began to transform it into a liveable paradise. The book chronicles both the exciting and mundane events of their lives, becoming, in part, a “how-to” guide for island survival. With the nearest shops a four-hour rowboat ride away, making the island as self-sustaining as possible became a necessity. They lived without running water or electricity, chopping endless armfuls of firewood and digging wells. Nan planted gardens where she tended to vegetables, herbs and flowers, and Art painstakingly cut trails through the island’s thick forests and maintained their simple wooden homestead. Each night, they would relax by firelight, with Art reading aloud to Nan from their library. Life continued on this way until they were parted by Art’s death in 1985, and Placentia was given to Maine’s Nature Conservancy. Throughout all of the stories and photos and diary entries, the book becomes more than about the life of two people, but a romance that will touch anyone who, however fleetingly, has ever wished to run away with their beloved, and live alone like Adam and Eve in a simple Eden. Misunderstandings and bickering happened, of course, but the couple were linked together by shared jokes and made-up words, little notes left at the door, and the knowledge that every night, Art would chose a book to read to Nan and it would be, in her words, “always the right thing”. The Kellans had all they needed on Placentia, barring the occasional rowboat trip to the mainland for things which couldn’t be grown or built by their own hands. Most importantly, they had each other.